You must have seen Michelle Obama's portrait by now. And likely you have an opinion about it. I have heard chatter about our former first lady's skin tone, her dress, and that the painting doesn't look like her. Whatever you think, you need to know a bit more about the portrait before forming your final judgement. Why Doesn't Michelle Obama Look Black? Amy Sherald, the artist who painted Michelle Obama, renders her subjects, the First Lady included, with a technique known as "grisaille." You may associate the term with monochromatic wallpaper, but it is also a manner of painting in grey tones. Here is another example of Sherald's work using the grisaille technique. For Ms. Sherald, the grisaille technique acts as a two-fold metaphor. First, the grey tones remove the question of race altogether. Michelle Obama can be seen as a woman, not specifically a black woman. 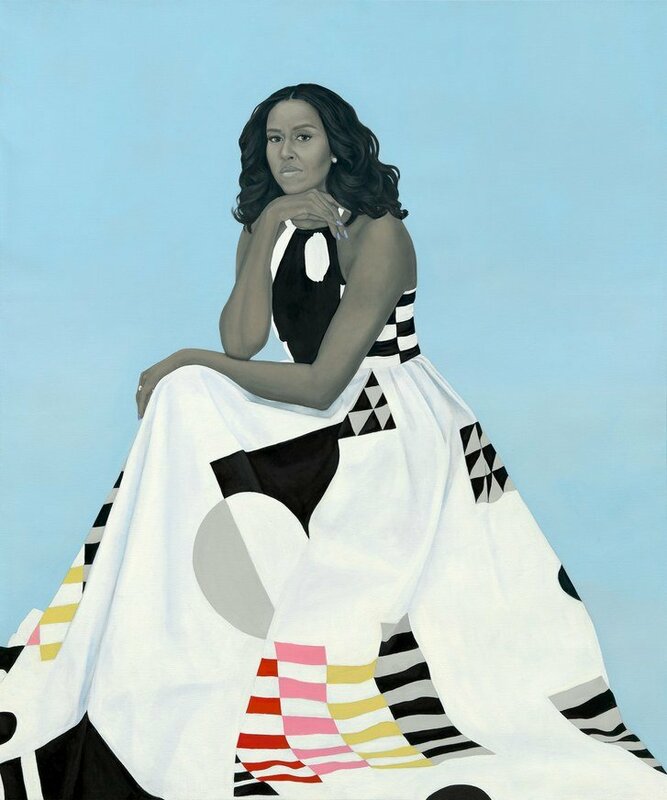 I think one could view the portrait (simply by the manner of painting) as a reminder that while Michelle Obama might have been our first First Lady of color, she worked in her position for all citizens regardless of race. Second, the varying shades of grey are perhaps a subtle nod to the mixed racial backgrounds of many African-Americans which often goes unacknowledged. The gradation of tones makes a powerful statement about racial history. Artist, Amy Sherald clearly said a lot by what she chose not to do: paint Michelle Obama black. The dress Michelle Obama is wearing in the portrait, just like her skin tone, also speaks volumes. The prominence the gown is given in the composition as a whole is very consistent with Michelle's practice as First Lady to use fashion to make a statement. Rugs based on the Gee's Bend quilts. In addition, at the portrait's unveiling, Sherald explained that the colorful pattern reminded her of the quilts made by the black women of Gee's Bend, clearly establishing that the gown was a way to celebrate an important part of black women's heritage. You think? Her arms are there. So is her mouth and eyes. Sherald explained that her approach to portraiture is not literal, but rather intentionally conceptual. In other words, Sherald just didn't get it wrong. Michelle Obama has elaborated that she is the first in her family to ever have a portrait painted. Most of us never have this done. Obama chose Sherald to interpret that feeling her. Sherald's composition provides one clue to how she captured Michelle Obama's journey to First Lady and an official portrait for the Smithsonian Museum. As Doreen St. Felix, in the New Yorker noted, Sherald gave the dress the triangular shape of a mountain, with Michelle at the top. It's only a small leap to consider that perhaps Michelle Obama deemed the climb arduous and monumental. Personally, I like that you might not recognize Michelle Obama in the portrait from far away, instead seeing the figure as any beautiful black woman. (Of course, the world has seen the painting so often, not recognizing the sitter is unlikely to happen any time soon). But imagine you were from Mars. Then, the abstracted image could be a suggestion that all black women are beautiful. What do you think of the portrait? Please tell me in the comments. Demand for Amy Sherald's work has gone through the roof since the unveiling. Are you surprised?